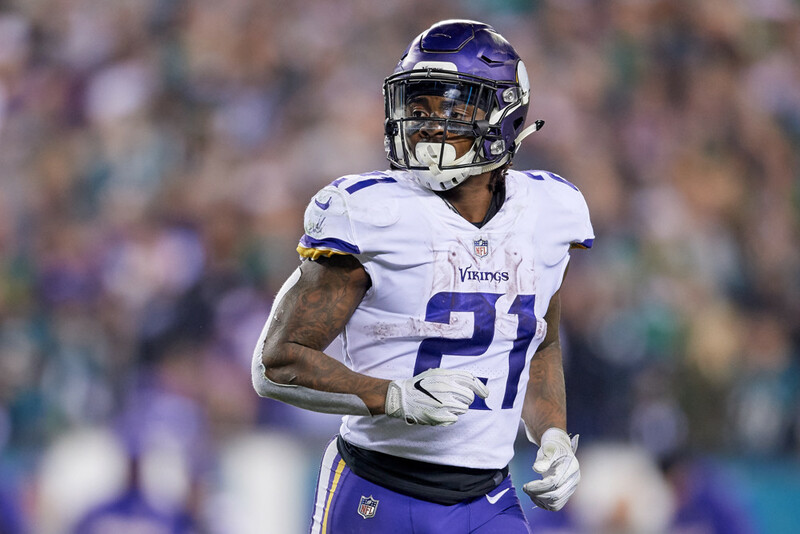 Jerick McKinnon has made his living in the NFL as a change of pace back, first behind Adrian Peterson, and more recently behind Dalvin Cook. Once Cook went down with a torn ACL, McKinnon stepped into a feature role for the Vikings, and the initial returns were good; McKinnon scored over 20 fantasy points in three of the next four weeks. But beyond that his heavy touch share yielded inefficient production as his 3.59 yards per carry were second worst in the league. 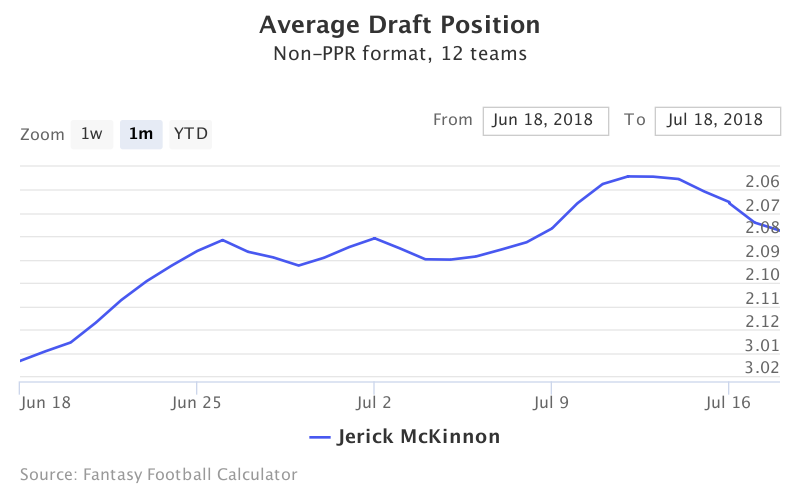 McKinnon is currently being drafted as the 13th running back and has held steady at an ADP of 2.09 overall in PPR fantasy football ADP. Data is from 12-team PPR mock drafts. That second round ADP for McKinnon puts his value solidly as a RB2 bordering on RB1. That's quite a rise for a player who has never carried the ball more than 159 times in a season. The determination that players will need to make is whether the opportunities afforded to McKinnon in 2018 will translate into top 15 production at the position. McKinnon's hype heading into 2018 is sky high because of the perceived price San Francisco paid to bring him to the bay, the amount of touches that will be afforded to him, and the lack of viable challengers to those touches in the backfield. Let's take these one at a time. McKinnon was brought to San Francisco by Kyle Shanahan, considered one of the best offensive minds in football. Clearly they value his skillset. But it's worth noting that the 4 year, $30 million contract that he signed has a team option after the first year and a base salary of only $4.2 million. Meaning they haven't really committed to McKinnon past this year. His biggest positive for 2018 is the share of playing time. With only Matt Breida and Joe Williams behind him, McKinnon looks in line for 250-300 touches in what could be a decent offense. That seems to assure a high fantasy floor. But when provided with 150 carries the past two years, McKinnon only mustered 3.4 and 3.8 YPC. If he is as inefficient as a lead back in San Francisco, it seems very plausible he could be rotated back to his change pace role with Breida or Williams consuming a fair share of the touches. Based on potential touches alone, McKinnon looks to be a useful fantasy asset in 2018. But his current ADP of 2.09 is far to high for a player you draft purely on the hope for volume touches. He hasn't show the ability to be an every down back and only had plus receiving skills. Drafting strictly on volume and not skill set is a recipe for disaster. With McKinnon being taken above such RB1 candidates as Joe Mixon and Jordan Howard, it would be silly for him to maintain this ADP. Let another one of your league mates reach for him there, and take a player with more upside and a better track record.